City officials in Nanaimo are providing few details on the plan to dismantle a homeless camp where about 300 people are living, as a court ordered deadline approaches. Mayor Bill MacKay says it doesn't make sense to push homeless campers back onto the streets when new housing to ease the crisis in Nanaimo is set to open next month. "Nobody wants to disperse people into the community when help is just around the corner," MacKay said. 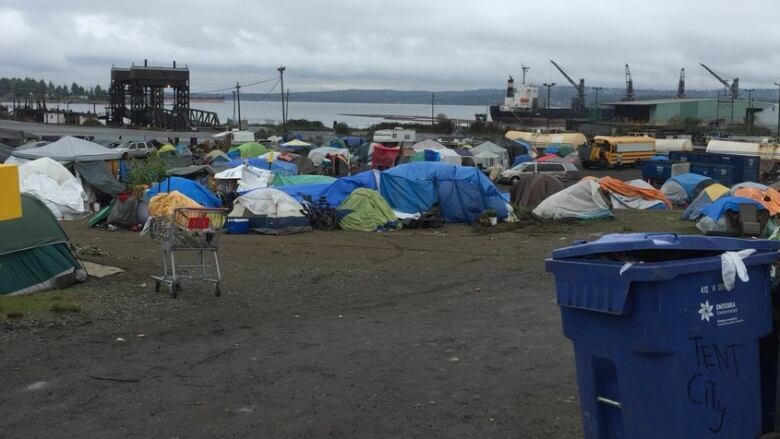 The city plans to start playing a role in monitoring and managing the homeless camp once the court deadline passes, but won't push for an immediate removal of all campers, MacKay said. "We intend to go in and manage that site and deal with the people who need the help the most, and ask the balance of them to simply leave." However, Karen Fry, Nanaimo's fire chief and director of public safety, says the direction from council at this point is to enforce the court order, once the deadline passes. But Fry declined to give timelines around when enforcement would begin and how long the campers may remain at the site. "The camp will be closed. As to the exact date that that is going to happen, I can't provide when it will be completely cleaned out," she said. "But we are adhering to the law of the courts and we are trying to do it in the most respectful and taking into consideration the people that are there." The City of Nanaimo successfully petitioned the B.C. Supreme Court for an injunction to remove the camp, which has swelled to roughly 300 residents. The court order set a deadline of Oct. 12 at midnight for people to leave. Meanwhile, Noah Ross, a lawyer for the homeless campers, said he is also seeking to extend the deadline for the campers to leave through a court application. The province has asked Nanaimo to allow the campers to stay following its announcement that 170 units of temporary modular housing will be built on two pieces of land in the city. "We are calling on the city to commit to the planned phased approach to the closure of the camp," said Housing Minister Selina Robinson in a statement last week. "This phased approach would involve increased security and monitoring of the camp while campers remain at their current location until the housing is open." On Thursday, the ministry said it is still hoping Nanaimo will comply with the request. The new temporary housing is scheduled to be ready for occupancy by late-November. But some who live in the tent city say there is plenty of confusion and fear about what will happen at the deadline. Wendy Lessard has been staying at the camp with her husband for several months. She says they plan to leave before they are ordered out, even though they have nowhere else to go. "We used to push around a cart with our stuff in it. Not looking forward to doing that again," she said. "People always talk about the negative stuff in a tent city, but it isn't like that for everyone." Although the camp is being shut down over safety concerns, it still a safer place than the streets and provides a sense of community, Lessard said. Advocates who work with people who are homeless in Nanaimo are also calling on the city to avoid pushing all of the tent city residents out at the deadline. Even with the camp still in place, people are already sleeping rough in dozens of other areas of the city, said Signy Madden, executive director of United Way Central and Northern Vancouver Island, which funds outreach programs. "That puts stress on neighbourhoods. People are in the parks, they are around schools. They are just trying to find shelter," she said. Those who live and work near the contentious camp are pushing for an immediate closure, said MacKay. "I don't think it is reasonable to expect that. When you've got the remedy that will hopefully start arriving in Nanaimo toward the end of the week and the first of next, and you can see an end in sight. Let's not push it," he said. "Let's be rational and pragmatic about how we do this."